How to cook raw shrimp like a seasoned culinary artist is not as complex as you might think. With a little experimenting, coupled with some basic culinary techniques, your new skills will turn out an absolutely scintillating dish. Shrimp comes in many packages; from frozen to raw shrimp, peeled or unpeeled, veined or deveined. There are hundreds of types of shrimp in different sizes, from baby shrimp to warm-watered jumbo shrimp. The choices are remarkably diverse since the shrimp became widely accessible with the advent of sustainable shrimp farming. The flesh looks and feels firm. Each shrimp still has a full shell attached. Odor is fresh with a mild saltwater scent. The flesh colors range from grayish-blue to white. Frozen Raw Shrimp or Fresh? Nowadays, most shrimp is immediately flash-frozen on boats and defrosted later to preserve its freshness. Thus, more often than not, the fresh raw shrimp you purchased was previously frozen at sea. Buying either fresh or frozen shrimp are both viable choices based on individual preference. Frozen raw shrimp will last up to one year in the freezer; fresh raw shrimp, stored in an airtight container, will last up to three days in the refrigerator. Purchase only unpeeled raw shrimp, whether fresh or frozen. Frozen processed shelled and deveined shrimp lose even more flavor than do the truly fresh shrimp that is peeled and deveined at the market. If a recipe calls for fresh raw peeled shrimp, purchase it from your fishmonger but cook it within twenty-four hours. Preparing raw shrimp begins with cleaning your shrimp in fresh water. If frozen, defrost shrimp in the cooler overnight, or thaw in a sink of cold water. Peel shrimp by cutting a slit through each shell with scissors and peel. Tug the tails off or leave for decorative appeal. With a knife, gently cut along the back of the shrimp to remove the dark vein. Rinse to dislodge each vein.If shrimp is unpeeled, slice the shell along the back of each shrimp in order to remove the vein. However, if you butterfly peeled or unpeeled shrimp, removing the vein is simplified once the flesh is flatly opened. Rinse thoroughly. Raw shrimp is incredibly versatile. It quickly absorbs shrimp marinades and is flexible with most culinary techniques like grilling shrimp kabobs, steaming, deep-frying, stir-frying, baking and poaching. How to cook raw shrimp like a culinarian also requires excellent recipes: Why not try one of these appealing shrimp recipes? Combine spices and herbs to make a shrimp boil seasoning mix. Divide and set aside. Add shrimp and 1/2 of the shrimp mix into a mixing bag; shake gently until the shrimp are evenly coated. Chill for 30 minutes. Set chilled shrimp into an electric food steamer; fill steamer with liquid and seasoning per manufacturer instructions. Steam the shellfish for 6 to 10 minutes. Serve immediately. With a stock pot and steamer basket, add beer or water until it barely reaches the basket; season with half the shrimp mix. When water reaches a boil, add shellfish and lower heat to a simmer. Sprinkle more seasoning over the shrimp, as desired. Melt 3 sticks of unsalted butter. Blend all ingredients together, except for the shrimp; add a splash of wine. If using flavored butter, melt and proceed to the next step. In a mixing bag, add the shrimp and seasoned or flavored butter; coat evenly. Marinade for 30 minutes. Thread skewers with shellfish; reserve the marinade for basting and dipping. If using wood skewers, soak in water to prevent charring. Brush grill with oil. 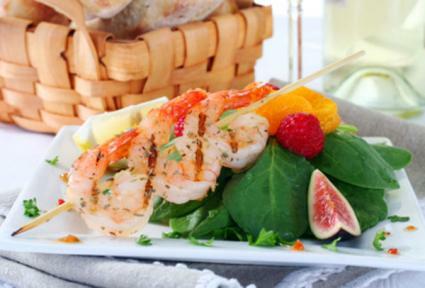 Grill shrimp kabobs over medium heat for 3 to 5 minutes on each side, basting often. Serve immediately with a side of flavored butter. Never overcook shellfish. An average medium-sized shrimp is fully cooked in 3 minutes. Shrimp is perfectly done when its color turns pink, and its flesh is no longer translucent but opaque. Never defrost or cook shrimp in the microwave. Microwaves cook from the inside out causing shellfish to harden. Should you leave the shell on is a question of discretion premised on individual style and taste; yet, keep in mind, cooked shelled shrimp are considerably more tender and flavorful over their peeled counterparts.